Looking to make a few extra bucks during the holiday season? This $200 BBVA Compass bank account bonus doesn’t get much easier as it can be earned in your PJ’s. That is a nice change, not only can you get a free bank account, you can get paid for opening it. Before you open the account, which must take place BEFORE November 20th 2017, you need to read a few of these key details. Note, only one offer can be earned per household, since they run a soft-credit check you can’t use a false address while applying. You must be a new BBVA Compass consumer checking customer who has not had a BBVA Compass consumer checking account open within the last 90 days or closed due to negative balance to be eligible for the bonus. 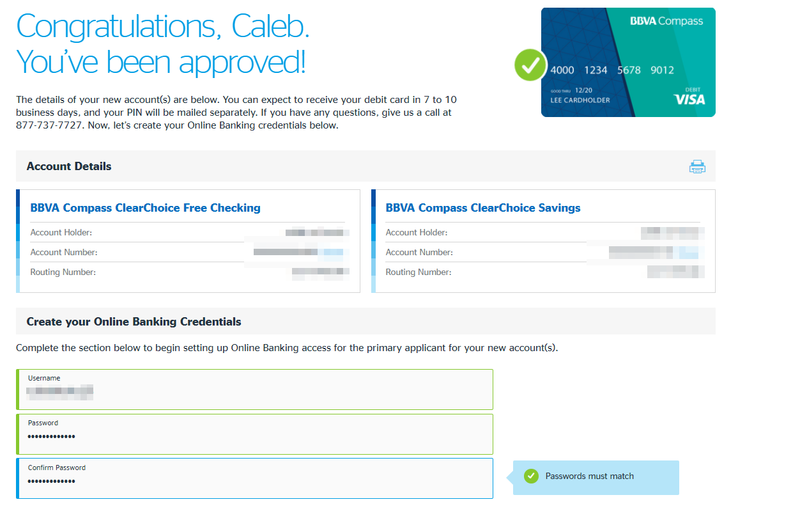 Eligible accounts include BBVA Compass ClearChoice Interest Checking, BBVA Compass ClearChoice Free Checking, Clearconnect Checking, and Easy Checking. Eligible accounts for residents of AL, AZ, CA, CO, FL, NM, TX include BBVA Compass ClearChoice Free Checking, BBVA Compass ClearChoice Interest Checking, ClearConnect Checking, and Easy Checking. Only BBVA Compass ClearChoice Interest Checking and ClearConnect Checking are eligible accounts for residents of all other states. Offer is valid for accounts opened in branch, online, or by phone. Within sixty (60) days of account opening, at least one electronic direct deposit from an unrelated 3rd party (e.g. your employer or a government agency) in the amount of at least $300 must post to the new checking account. The $200 cash bonus will be deposited into the new checking account within 60 days of meeting the bonus requirements described above. The account must be open with a positive balance at the time the bonus is deposited. This is where is gets interesting. You can fund the checking and savings account up to $5,000 using a credit card. That is $5,000 per checking and $5,000 per savings account. Many of the data points are showing the best success using a Bank of America or Capital One credit card. I decided to fund the checking account with my Capital One Spark card earning 2% back. After spending $4,900, I will earn $98 in cashback in addition to the $200 bank account bonus. You can only use ONE credit card for the funding, I decided not to try funding the full $10,000 between checking and savings as it could trigger a fraud alert with Capital One. If the online credit card funding does not succeed for whatever reason, you CANNOT try again by phone or online. You have ONE shot to get the funding to go through. Data points are showing that Chase cards are coding the funding as a cash advance, not a purchase, I wouldn’t recommend trying with a Chase card since you only get one shot. Since you have until the 20th, you could open a new credit card and use the funding to wipe out your minimum spend. For existing cards with Capital One or Bank of America, the Alaska Airlines credit card is a good option. You’ll earn 5,000 Alaska Airlines miles if you fund $5,000. You can read about a trick we used to fly from the West Coast to East Coast for only 5,000 Alaska Airlines miles one-way.